When I met Caroline Beasley-Baker in 1988, she lived in New York City, where she made installations that included paintings, poetry, and sound.They were magical rooms to enter as one might enter a temple, another time or another dimension. Caroline Beasley-Baker received her MFA from Syracuse University, and has also received two Ford Foundation grants. Much of her early work included site specific sculptural installations. In 1982, after moving to New York City, she began to make mural size paintings, which had their origins in earlier paper collages. With her installation " A Magic Spell For The Far Journey", she synthesized painting with environmental sculpture. "A Magic Spell for the Far Journey" was the title for a group of painted panels that had unique "voices" - as mythic figures emerged from the dreamtime to dance, combine, and engage, they became, truly, a visual chant. The song continued with her installation of Between Land And Sky: Vision And The Sea, and then Giotto's House At Night By The Fire, which was installed at the Anchorage, an impressive group of chambers that form part of the Brooklyn Bridge. With imagery that often arises from her dreams dreams, the "voice" Caroline Beasley Baker sounds is perhaps ultimately the voice of nature, made visible through the mythic personae invoked in her installations - the voice of the Earth "singing itself into existence". Lauren: How did your installation Giotto's House evolve? Caroline: I created it at The Anchorage, big vaulted chambers which are part of the Brooklyn Bridge. The project was organized through Creative Time, a nonprofit arts organization that does art in public places. I called it Giotto's House At Night By The Fire." The viewer entered a path, went up a set of stairs, and viewed the work from the central area. 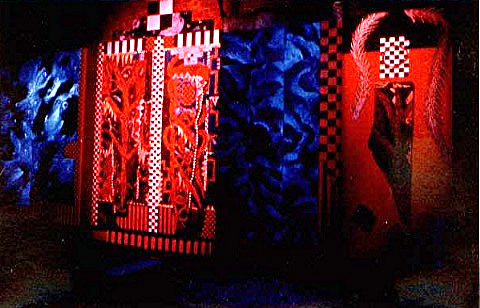 The installation was also envisioned with a two-dimensional aspect to it, which was a painting I did composed of panels. Together, they are approximately 14 feet by 48 feet, and could be installed on a wall, or wrapped around a room. The panels, which form one whole painting, have individual titles or themes. Lauren: Why did you use coal on the floor of Giotto's House? Caroline: Anthracite coal has all these facets, you get those bituminous colors on it - fields of blue and green and magenta. And coal is black and reflective. It's a good personification of the Moon. It's also a transmuting element, because it's dark and apparently cold, yet has the potential for fire. Caroline: Right! So it's full of references! While in graduate school, I made installations for landscapes. I also created highly colored collages, experimenting with different media. My impulse was to make some sort of figure. I have an ecstatic relationship to the land, I've always wished I could somehow become part of it! So, I wanted to unite landscape and figure. I thought of the land as having a "voice". In my imagination, I've always described myself as a "landscape", and when I taught figure drawing, I taught it as landscape. That was my bridge between spirit and nature, so to speak. The collages I was making at that time were increasingly personifications of landscape, and I wanted to move them toward an individual identity, to give them "voice". I've often heard words and songs as I work. I felt an underlying pattern or rhythm. I wanted to include that sensation, to make it part of the structure. "Singing" seemed important. The creation myth of the Australian Aborigines involves the idea of "singing the world into existence". I wanted to feel a musical time in the work, as if I was walking and singing. Again, here is that relationship between figure and land: I saw rhythm reflecting consciousness walking across the land, the walk of consciousness. The sheer act of walking creates rhythm. SONGLINES, by Bruce Chatwin, talks about that. He says the development of consciousness is coincidental to walking across the Earth, naming things. So I found myself making all these funny red lines, which I thought might be blood, rivers of blood. It occurred to me I was also talking about the "blood of the Earth", which was another way to give "voice" to the land, to personify it. There are all of those associations......and as the ideas evolved, I began to dream about jaguars. I had many dreams at that time about Mexico, and the Indian cultures there. Lauren: Does much of your work come from your dreams? Caroline: Dreams frequently precede what happens in my work. It's like what I was saying about the poem being not so much a reference, but a part of the work. The dreams are a part of the work as well, there's no separation. When I began having Jaguar dreams, I had also, at that time, decided I wanted to give more structure to the work, so I began a series of mandalas. And I wanted to include the jaguar. My dream was about a house in the country. There was a jaguar on the loose, and my job was to protect the house. So, I secured it from top to bottom, and as I came to a set of French doors, I kept hearing a voice say "Ocelotl, Ocelotl", which is the Nahuatl name for the jaguar. I closed the doors just as the jaguar arrived, but he came up under the doors, because, of course, he was a magical creature. I had to kill him then, I didn't have a choice. I began to strangle him, and as I did, I looked into a face so completely other, so alien, so wild, I just began weeping for its beauty and its innocence. I realized I was taking on the spirit of the animal. Thinking in animistic terms, I took on responsibility for his spirit. I had been given a totem. So, when I began making mandalas, I decided to us the imagery of the jaguar. I used re-occurring dots in the work as a symbol for it. Lauren: Were you infusing the spirit of the jaguar in the work? Caroline: I knew, whether I liked it or not, the work was going to be about the jaguar in some way. At that time, I was reading THE SECRET OF THE GOLDEN FLOWER, which is a translation of a Chinese alchemical text. There's a section called "A Magic Spell for the Far Journey". I really liked that! It eventually became the title for the installation. One thing I especially liked about it was that the "magic spell" was one of the few rites that occurred in what they called "the living midnight". When the other world comes to life. Thomas Mann distinguished between sunlight and the light of the moon, the light of the unconscious. So, the other world is a mythological world, a world where time is altered, there is no place or time. I liked the idea of a "magic spell", because I wanted to use repetitive elements that would not only give a sense of the movement I was talking about, but also would function as an incantation. Like using rosary beads, or the repetition of a mantra. Caroline: A visual incantation referring to both spacial and temporal movement across the landscape, associating land and figure in a very particular way. Plus, it embodies the idea of prayer. Lauren: A Magic Spell for the Far Journey. Can you describe the journey? Caroline: Joseph Campbell talked about the Hero's Journey. It was the mythological quest, the journey into the unconscious. The title seemed appropriate to me, since that "quest" has been my lifelong impulse. I also knew that whatever journey I was going on, I was being taken on it. I was walking through a set of cultural ideas that weren't my own, but obviously were ideas relevant to who I was, ideas important for the work I was doing. So, when I finished the Mandela and put it against the wall, I realized I'd also created a mask with a big open mouth. I needed a title, and thought about something that sings - like "Where Nightingales Sing". But nightingales weren't the right kind of bird. So, I just opened up a dictionary, and it opened to "Hummingbird". And I thought, "That's it!" The painting is Where Hummingbird Sings. Because hummingbirds are native to Central America. It later turned out that Hummingbird is a deity of the Mayans and the Aztec. In Aztec mythology, Hummingbird was the war deity. So, that began a journey of mythological references for me. Cry for me who is lost from the tribe of my soul. Lauren: Hummingbird was a spirit manifesting through your painting? Caroline: I realized, psychologically or literally, and I'm not sure what the difference really is, that I had manifested a particular personification, Hummingbird. It had a voice. I finally made something with a voice. And that's what it said to me. Lauren: As you talk, I begin to understand that your work, the dance of your creative process, is not much separate from the product. Caroline: It's all the same thing. I don't see any distinction between the vision, and the work. It's just part of the process. And the journey is the living of the life, the vitality in the myth of the life. Increasingly, my life has been an act of myth. That's what the work I do is about. As the paintings grew, I decided I wanted to paint an entire environment. My need to reveal the connection between land and figure, between the sacred and the profane, or the material and the spiritual worlds, needed to become literal. I needed to touch things. So, I began painting the walls, touching them. There are many traditions of women painting house to bless them. It's blessing the space you have. Mythologically, the "voices", for me, have been three female voices to one male voice. This represents re-balancing the world with what's been hidden, the feminine aspects of myth and power. I remember I was sorting through old works on masonite, and after a while, I realized I was saying to myself over and over again, "Mother, Mother, Mother". I subsequently learned that according to Hopi tradition, the next tribe or the next clan to come to prominence in the material world is the Mother Clan. To me, that represents re-empowering aspects of consciousness that have been subdued, and thus distorted. I think my impulse toward rhythm, the use of patterns, is a part of this. Lauren: And your desire to synthesize visual art with music and incantation. Caroline: Is a feminine impulse. And part of nature and what has been hidden. At one point in the work, I discovered that I was making a "Wedding Tent". I opened THE BOOK OF THE HOPI, by Frank Waters, to a section on the Sacred Marriage, and learned it was the only ritual in their tradition that took place at midnight. The myth concerns the marriage of Snake Woman and Antelope Boy, which seemed synchronistic at the time, because just before I opened the book, I had finished a big relief for the room, which I had named Snake Woman. So, there was the Sacred Marriage of the Snake Maiden and Antelope Boy, the marriage of the Earth principle with the Sky principle. I also discovered a parallel in Aztec mythology. At the point of Cortez's arrival, the commander of the Aztec army was called Snake Woman. And Hummingbird was the war god. So, a marriage and a war! Doing all this stuff is magic. .There is a connection between individual consciousness and something greater, which is what I mean when I say magic. That connection is the truth; that's reality. So, reality is magic, and in that sense, what I' m doing is "magic". My experience of God as a child was literal. I always felt I had somebody to talk to. The conversation was direct, it wasn't something some one else had to do for me. I didn't have to go somewhere to do it. As I grew older, I realized not everyone took it for granted, and that I couldn't talk about it. I went to all kinds of churches, trying to find something that allowed God into the world. Religion, to me, is seeing the Earth as alive, as vital and with Voice. That experience, I believe, was primary to tribal cultures. It probably is a primary experience before self-consciousness. For me, the individual is simply part of the whole picture, no more or less. Understanding that, if anything, has given me more sympathy for my animal self, my humanness. It's a relief to think of myself as an animal, with a group of animals, and one with needs, like the need to sleep and eat, to have and give affection. It's made living easier for me. And as long as I'm singing, as long as I'm making my art, the rest of life is easier, more comprehensible. I like the Aboriginal idea of "Singing the world into existence". I once had a wonderful dream. I dreamed I was riding across the Australian desert at night. I was on a bus, and everyone was asleep. I looked out, across the dark, and saw, rising up out of the desert floor, these incredibly beautiful murals, in huge caverns lit by firelight. I knew they had been made by some consciousness predating humanity, that they had been here for millennia. They had never been seen in the world before, and were now rising up to the surface of the Earth. Those paintings were more glorious than anything I've ever seen in my life! At the end of the dream, a voice said to me, "Caroline, that's the Earth dreaming". The Aborigines also believe that everything rises from the Earth, everything rests in the Earth and emerges when its time. That's what my dream was about: the Earth dreaming and awakening. Lauren: Do you believe there is some kind of awakening in the world now? Caroline: I do think humankind has a larger consciousness, extending beyond the moment each of us lives. We experience it as evolution, or history. But it's really remembering. Active redemption is an idea present in my work, and redemption means reclaiming one's memory. Lauren: Could you talk a bit about the structure of your installations, and your use of color? Caroline: I wanted to be able to move the paintings from place to place, no necessarily in the same order, but to combine and re-combine them in a new context. The conversation would continue, and would be about each new place. I have particular associations with certain colors, so in that sense my color is symbolic. Lauren: Why is the work presented in low illumination? Caroline: It looks best when there is no daylight. It glows, that's another reason for the heightened color. The installation I did at B.A.C.A. was called Between Land and Sky; Vision and the Sea. It was taken from a quote by D.H. Lawrence. He said, "The Earth is alive and the sky is alive, and between them we live." I lit the installation at a twilight level. It was a way to move from what we call the conscious to the unconscious, a passage from day to day reality and mythic reality. I want people to make that transition literally. People were also asked to take off their shoes, to further heighten the transition. When you take off your shoes, you immediately touch the ground differently, you change how you walk, you invite silence. It becomes like entering a temple. Although I didn't assume I had created a temple, I wanted that quality to be there. The work requires reflection. Lauren: You have many spirals, serpentines....is this identified with Mayan art? Caroline: I don't think it's a reference to any particular culture. I didn't specifically look at Mayan temples, although I did discover I was reproducing Mayan doorways, when what I thought I was creating were medieval altar pieces. And I realized I was surrounding myself with doors. Artists have always been fascinated with doors, because they lead somewhere! In Giotto's paintings there are always doors or caves, wonderful mysterious places you can't see into....like holes in the painting. That's where the spirit of the painting lives. We all do the same things over and over again. Somebody said that spirals are continually repeated in art. I thought, "well, of course they are! They're relevant!" I recently read a letter by Flannery O'Connor, in which she was talking about a dinner party where the conversation had turned to Catholicism. Somebody said that what they loved about Communion was the importance of the Host as a symbol, and what did she, Flannery O'Connor, think of it? She said that "if it's just a symbol, then to Hell with it!" I laughed! It was so right, because for me, the truth is that none of these things are really symbols - they are something. We all use triangles, squares, and circles, which are associated with three dimensional forms. But we don't have a three dimensional form for a spiral; a spiral is a visual symbol which is more line than form. A spiral is about time. Lauren: Is there any kind of response you would like to have from your audience? Caroline: I don't expect any particular response. I am mostly interested in gathering voices. Whatever people perceive is what they're able to perceive, what they bring to the work. I try to animate the work, to give "voice" to a particular idea. I often don't have a concrete notion of what that idea may be, so I let it develop and speak for itself. It's a way to have a conversation. Yet, it's more than that; in a sense, my work is about the Earth dreaming. If the Earth can dream and speak in the way that we do, these might be some of the things the Earth would dream and speak. It's fanciful, but I think this is what animates most tribal cultures, and it's what makes us human beings. Lauren: How can this make us human beings? Caroline: Unless you are aware of the source of your dreams, aware of some connection with who you are between God and Nature, there is no self-awareness, you are blind, and you're not fully human, because you don't know who you are. The importance of being human, to me, is in the act of recognition, in redemption of the memory of belonging. If you recognize yourself as part of a greater whole, it seems obvious you would want to share that experience with everyone, you would encourage everyone to have a greater humanity, greater understanding. We would function differently in the world. Lauren: Like a mirror? You would understand, in your relationships to others, that you are really "bouncing off yourself"? Caroline: Right. Being part of a much larger affair. One of the hesitancies I have in talking about this is that after a while it becomes cliché, there are people who have said it so much better. But, of course, I want my work to say it too - to speak with a simple truth.